The Index opened positive and saw huge buying interest from the onset to make a high of 8490 but saw some profit booking in the second half to close a bit lower at 8458.95, gain of 37.95 points. The broader market though was weak, with 637 advances to 845 declines. 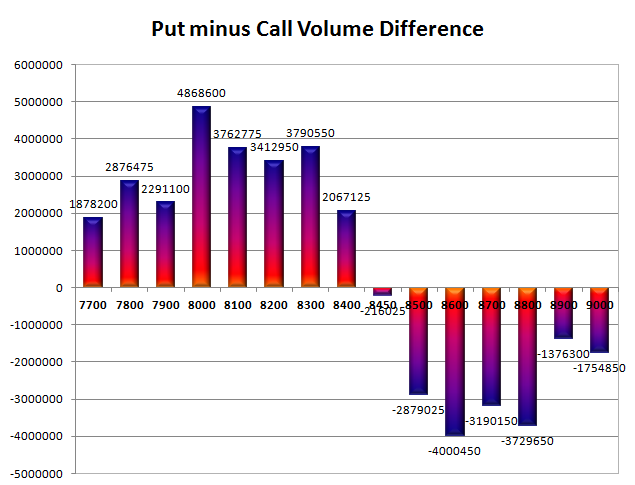 Range as per Option Table is at 8000-8600. 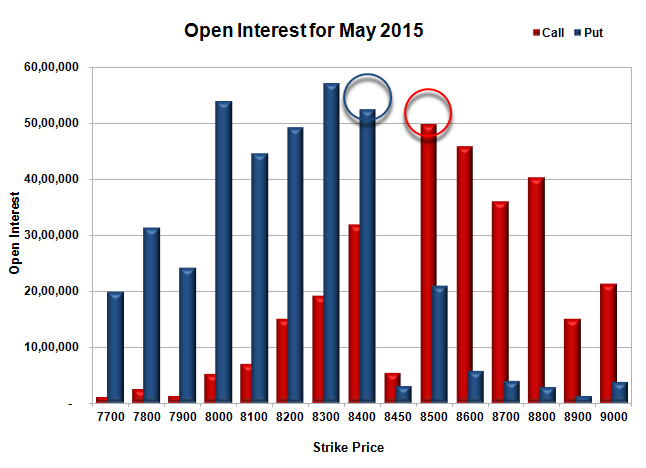 Call option 8800 added 1.25 lacs OI with short covering seen at 8400 and below strike prices. Put option 8500-8400 added huge 24.79 lacs OI with profit booking seen at 8300 and below strike prices. Nifty Open Interest is at 1,28,65,450 down by 2,79,000, whereas June series added 12.70 lacs with increase in price, most probably 100% rollover with huge long build-up. 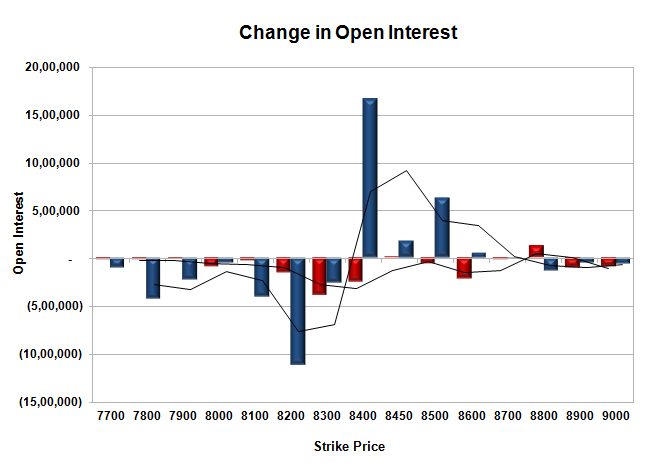 Bank Nifty Open Interest is at 17,73,000 up by 73,925, whereas June series added 0.79 lacs with decrease in price, most probably short build-up in both series. FII’s bought huge 6.74 lacs Futures, which includes 55102 contracts long build-up and 28140 contracts short build-up, with increase in net OI by 83242 contracts (includes 124501 longs to 97539 shorts for the day) and the Average Price comes to 9033.73. FII’s Index future open contract as on date is 329757 Longs to 317627 Shorts, Net Long 12130 contracts. Initial support at 8400, with OI of 52.55 lacs and below that at 8300 with highest OI of 57.10 lacs. 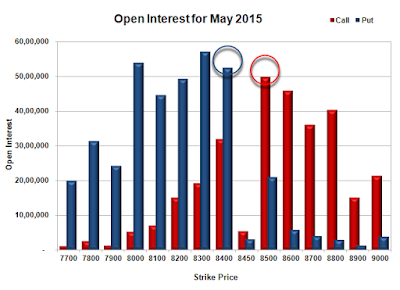 Initial and best resistance at 8500, with OI of 49.89 lacs and above that at 8600 with OI of 45.84 lacs. Day Range as per Option Table is 8381 - 8533 and as per VIX is 8384 - 8534 with 8456 as the Pivot.